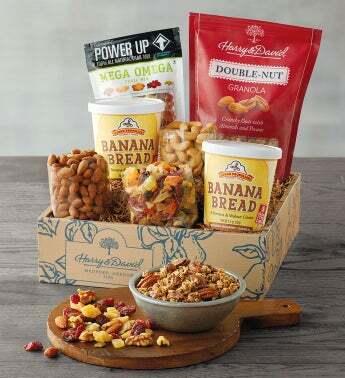 Send a gourmet gift that is as wholesome as it is delicious. We've gathered an assortment of goodies such as double-nut granola, jumbo cashews, Power Up trail mix, banana bread oatmeal mix, and more for a better choice in snacking. This gift is perfect for your health-conscious recipients and makes a great picnic on the go or a happy pick-me-up any time of day.